I was skimming some aviation blogs two weeks and stumbled upon a few gems. First, the Blue Angles were in Virginia! (I got super excited) But, they were in Lynchburg (end excitement) which is 4 hours and a full tank of expensive gas away from Alexandria. I had also gotten emails from AOPA on an event they were having in Fredrick, MD but that was still too far to drive. That Friday, I somehow stumbled across that Andrews Air Force Base was having an open house. 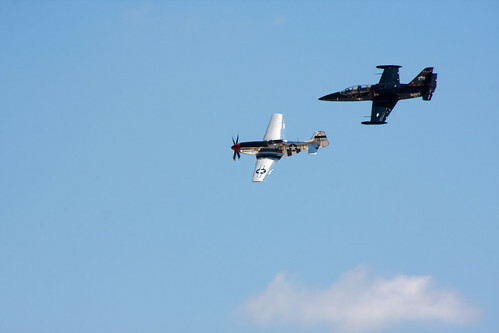 And, not just any open house: A joint service air show! Andrews is just across the Potomac from National Airport which is just a few metro stops from us. I told Joel we were going. Since it is a base, you can't park there. It seemed like drove to FedEx Field to get through security and take a bus to the base. (If you ever go, get there early and READ what you are allowed to bring with you.) This was my first time at the home of the Redskins - the Colts stadium is just so much better (go Colts!). The different branches of our armed services made security go rather quickly for over 70,000 people. They sure did a much better job than TSA does at the many airports I frequent. According to our local NBC, there were so many people at Saturday's show that they had to turn people away! Note for next year, get there early. Once we got to base, I was in aviation overload aka "aviation ADD"™. I drove Joel nuts wanting to do everything at once. Now. 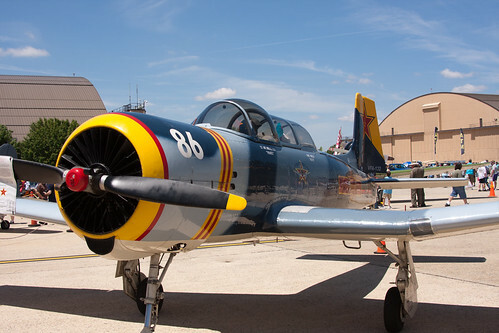 There were static displays of everything from home builds that EAA members had flown in to WWII fighters to modern day cargo planes. The Displays were staffed by the pilots that fly that particular plane. Surprisingly, there were actually several women pilots stationed at their planes! Minus the almost incursion of the SFRAA, they had to close the runway thanks to someone not associated with the airshow who did not file flight plan, it was a fantastic event. This was my first time at Andrews and I was rather impressed. Though, it is hard not to be when you are having aviation ADD™. I let Joel take most of the photos with his dSLR because looking up for long periods of time while holding a hefty camera still isn't a smart move for me. I did manage lots of video thanks to my iPhone. My first iMovie trailer is below. If you are interested, Joel's post on the air show is here. He has a different video and lots more photos.